Pivotal, the cloud software company that spun out of DellEMC and VMware, filed for an IPO last Friday to raise $100M. Pivotal is the first cloud native business to file to go public and closely resembles RedHat, the most successful open source software-based business. Pivotal’s IPO positively indicates cloud native businesses with open source offerings have the potential to go the distance. We believe open source is a crucial component of modern cloud infrastructure software companies and continue to be excited by cloud native startups that help developers and DevOps drive innovation at higher velocities. We expect to see more DevOps-focused open source software-based companies become unicorns. Pivotal’s IPO is just the beginning. Pivotal’s revenue grew from $281M in FY16 to $509M FY18, a compound annual growth rate of 35%. Its revenue stems from two offerings: 1) Pivotal Cloud Foundry (“PCF”) that is a platform to help streamline software development and 2) Pivotal Labs that is strategic services. Pivotal’s history as a services-oriented business is highlight by Labs revenue representing 66% of revenue in FY16. 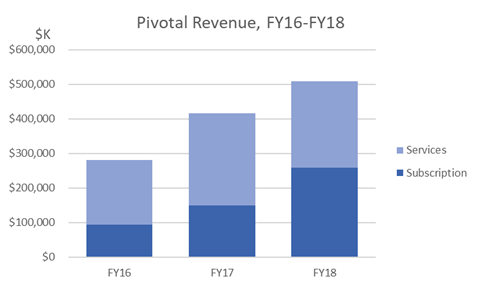 Pivotal has done a good job transition to a subscription-oriented business over the past two years with PCF now representing over 50% of revenue. Subscription customer YoY growth rates have slowed over the past three years from 140% YoY in FY16 to 16% YoY in FY18. Since new subscription customer additions have declined from a growth rate and absolute number perspective and first year subscription revenue by cohort has shrunk from the FY16 high, analysis suggests account expansion has driven subscription revenue growth. Pivotal notes that of the 73% increase in subscription revenue from FY17 to FY18, more than 85% of the increase was attributable to existing customers. Open sources software adoption is bottoms up rather than top down. Adoption often isn’t coordinated across the company but rather sprouts organically based on individual teams’ needs. Hence, open source software adoption patterns facilitate expansion opportunities within the account as solutions are often already utilized across teams before a salesperson engages. Pivotal highlights that the dollar-based net expansion rate was approximately 163% at the end of FY17 and 158% at the end of FY18. In turn, customer success teams’ ability to provide additional lift is critical. 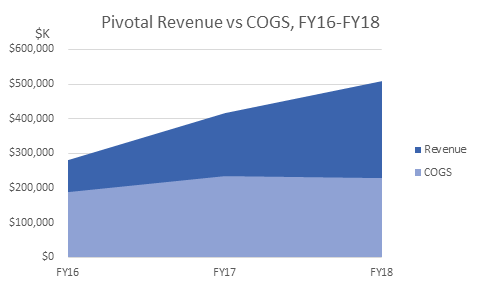 Pivotal has done an OK job managing COGS over the past two years as it has remained relatively stable, despite the company’s 73% YoY revenue growth in FY18. COGS stands for cost of goods sold. 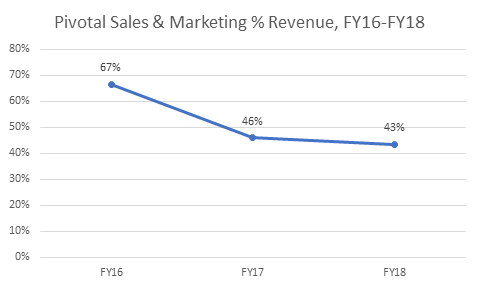 We expect COGS to continue to decrease as a percentage of total revenue as the revenue mix shifts more towards subscription revenue. Gross margin has improved due to subscription revenue being a higher portion of total revenue and gross margin on the subscription business increasing to 88% in FY18 from 64% in FY16. 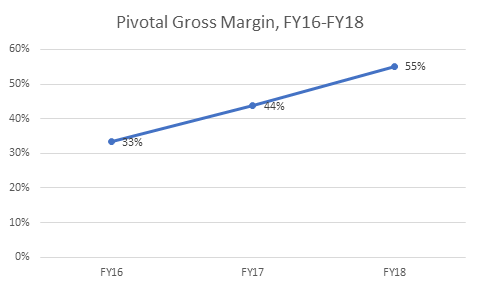 Given the company’s significant services business Pivotal is significantly below the public SaaS gross margin median of ~71%. Since Pivotal is still transitioning to a SaaS-first business model, we thought it was best to look at sales and marketing in terms of percent of revenue instead of sales efficiency ratios and magic numbers that are typically used to evaluate SaaS businesses. Sales and marketing margin of 43% has also approached public medians, now around ~47%. Most SaaS companies operate their businesses in this range. 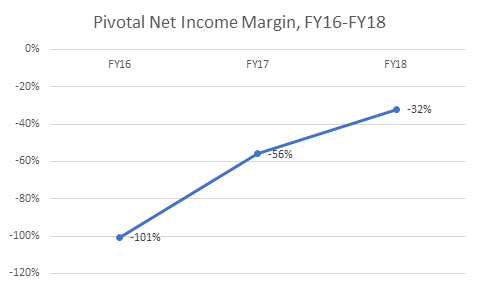 Pivotal’s net income margin of -32% is below the public SaaS median of -13% and caused by the its higher COGs spend on services and R&D expenditure, which is 32% of revenue compared to the public median of ~20%. The comparison to RedHat, a competitor with its OpenShift suite, is inevitable. The table summarizes some key metrics. The company has raised $1.7B in venture funding since 2013, including from General Electric, Ford, and Microsoft. Pivotal’s last round post-money valuation was $3.3B. Assuming the market values Pivotal similarly to RedHat, the implied market cap for Pivotal is roughly $4.8B. 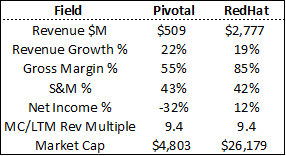 Given Pivotal’s YoY revenue growth rate is only slightly above RedHat, which is 25 years old, and Pivotal’s gross margins are worse due to the services mix, we believe Pivotal will receive a lower MC/Rev multiple so $4.8B market cap is likely an upper bound. We also thought it would be interesting to identify the popularity of key words. 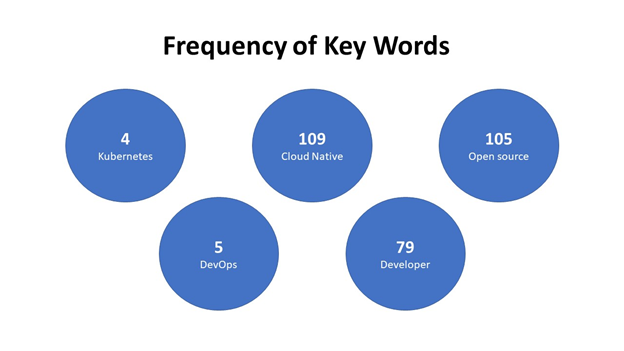 We were surprised to see that Kubernetes was only mentioned 4 times and DevOps was used 5 times. The frequent usage of cloud native in the S-1 underscores Pivotal is the first of wave of these businesses, and we should expect more high flyers going forward.